In order for an extension to support copying of an instance your extension needs to provide a service url implementing Itslearning.Platform.RestApi.Sdk.Common.Services.CopyInstance.ICopyInstanceService. Type of AuthorizationContext, see detailed description below. Identifier of the extension object to copy. It should already exist on extension side. Identifier of the target object. itslearning has already created it, so the extension side need to ensure that new copy refers to this identifier. Identifier of the extension object instance to copy. It should already exist on extension side. Identifier of the target object instance. itslearning has already created it, so the extension side need to ensure that new copy refers to this identifier. Each request provides both pairs of LearningObjectId and LearningObjectInstanceId, however you can only use one of them depending on your app’s specifics. The identifier of a valid API session. The customer identifier which is using this extension. The identifier of the person who is adding content to this instance. The first name of the person who is adding content to this instance. The last name of the person who is adding content to this instance. The permissions this user has on submitting HTML content. Itslearning identifier of the person who is adding content to this instance. Id of the newly created extension object if all successfully worked out. Id of the newly created extension object instance if all successfully worked out. Boolean value defining whether the operation was successfully performed. Make sure that LearningObjectId and LearningObjectInstanceId are valid and refers to the ones provided by CopyInstanceRequest - TargetLearningObjectId and TargetLearningObjectInstanceId. 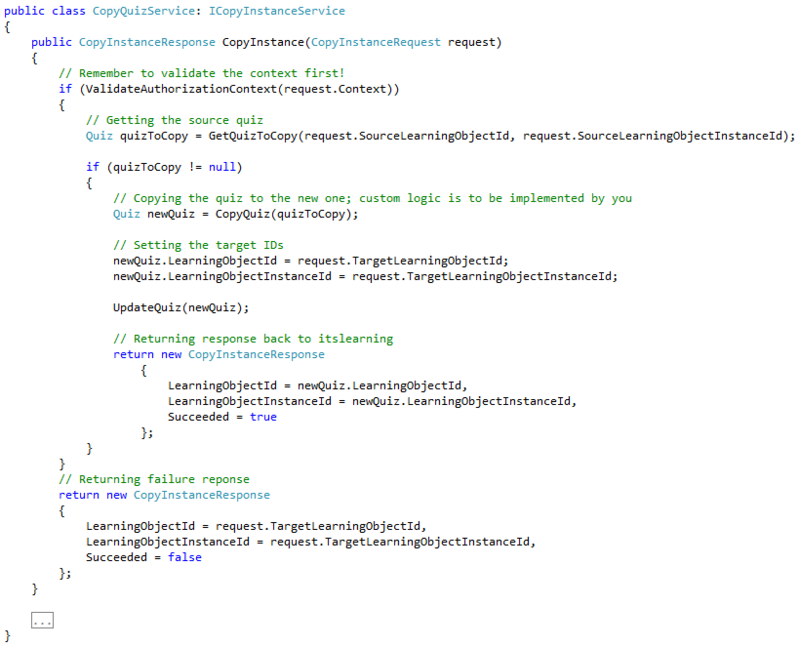 The itslearning SDK contains examples of .NET service contracts that can help with implementing the web services. Please refer to ICopyInstanceService interface included in the SDK. There is also AuthenticationInspector class, that contains logic for signing requests and verifying signatures. It can be specified in web service's web.config file as a behavior element, please find the example in Extend your application with import abilities .